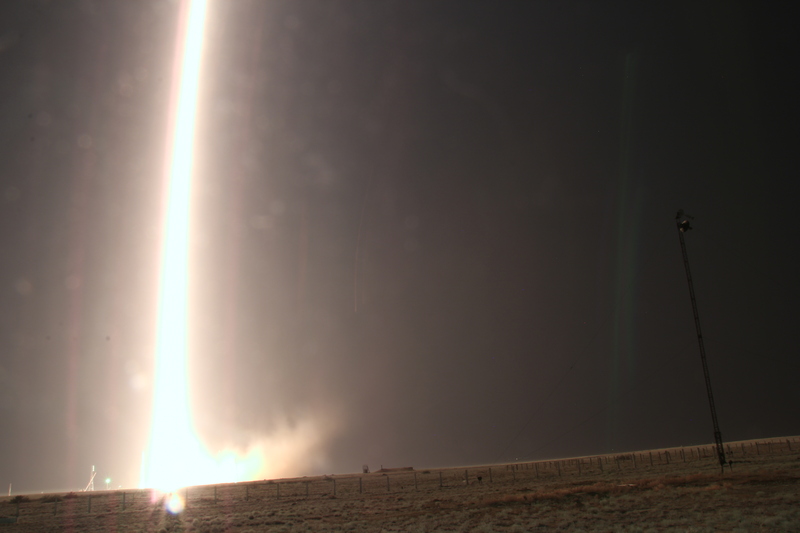 A flash of light, followed by growling and rumbling and shaking of the ground. Screaming and shouting people, blinding light. 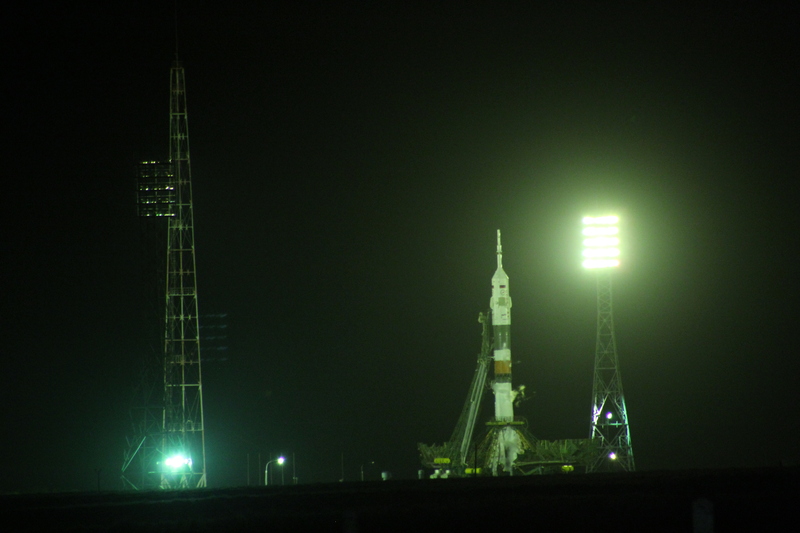 It is the moment we all have been waiting for with anticipation for the last months when the plan to see a Soyuz launch live and in person on site in Baikonur began to take shape. 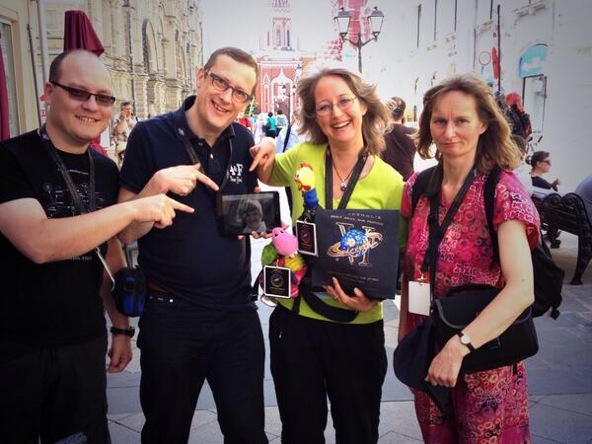 The adventure which should become #AlexTweetup. 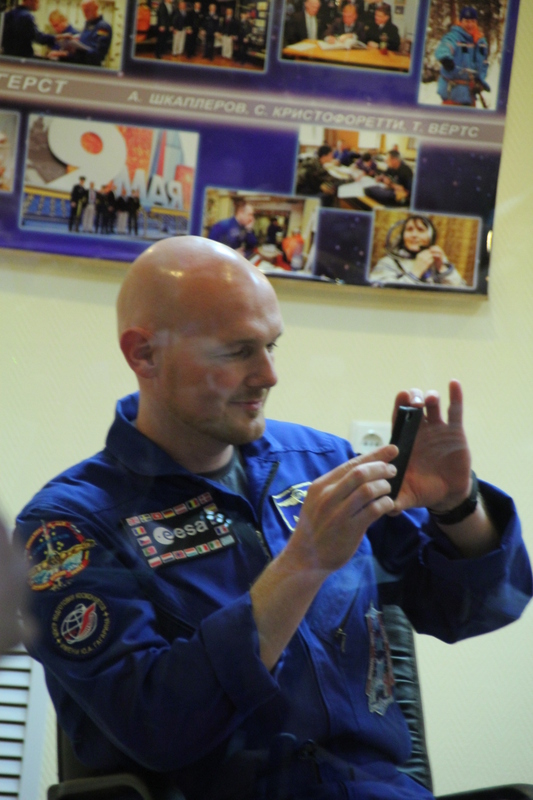 We have just returned from our trip to Spacefest VI (blogpost to come in the near future) just to recharge the devices, download all pictures” and continue to Moscow where we met the crew of #AlexTweetup. 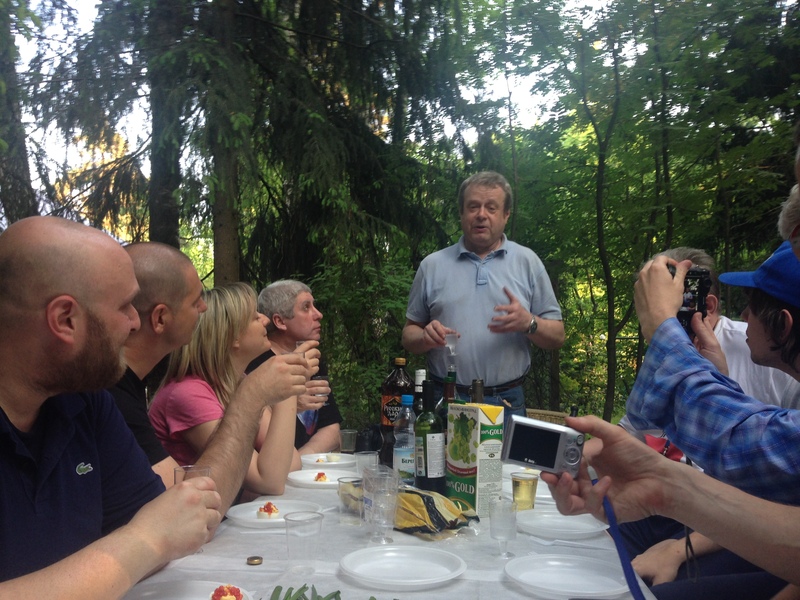 While Moscow is a beautiful city to visit in itself, this is a whole different story. 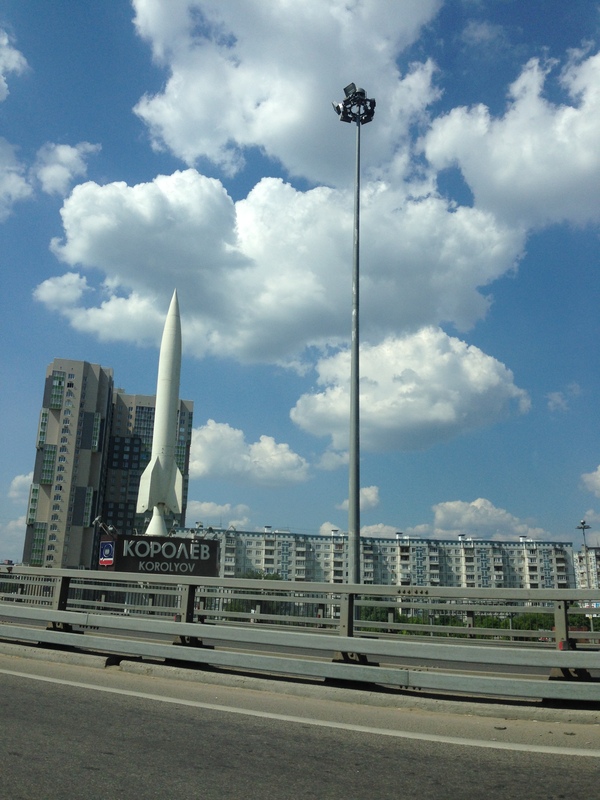 Our adventure really took off when we went on a trip into the suburbs to visit the city of Korelev. 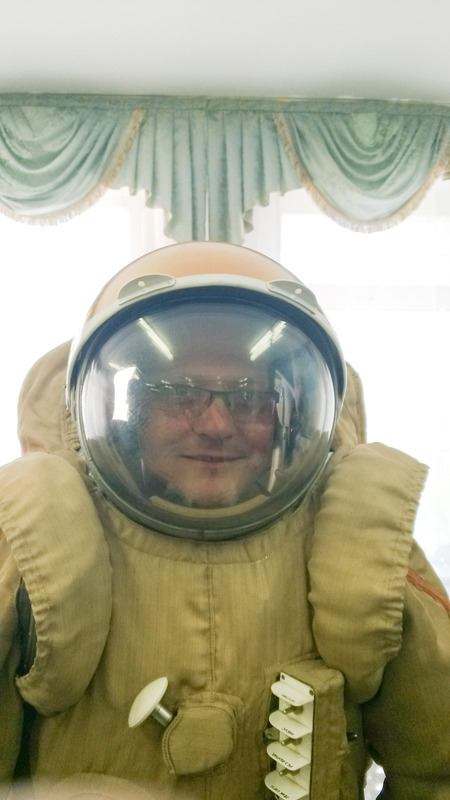 It is the crib of Russian Space exploration if you will. The trip there was supposed to be by train, but Yaroslav station apparently has more than one building and our inability to read cyrilic letters and the fact that the track numbering seems to be unique for each building let us miss the rest of the group and the train departed without us. The next train was to go in over two hours and so we decided to take it the Russian way and improvise. Our CERN tweetup friend Rob talked to the next cab driver who agreed to drive us to Korolev for 3000 rubles (around 60€). But “our” cabdriver had a better idea and called one of his friends from the cab behind him and directed us to him instead. 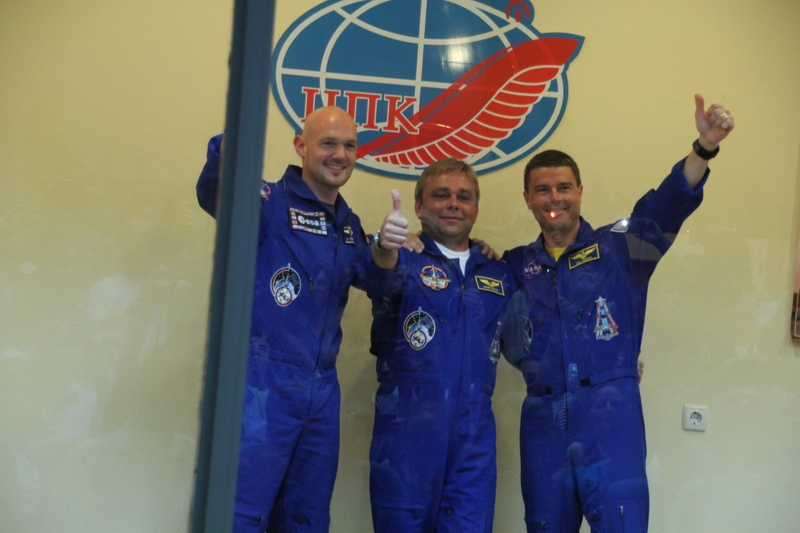 Well no problem for us, but the 2nd guy didn’t speak any english and we really didn’t know where to go in Korolev. 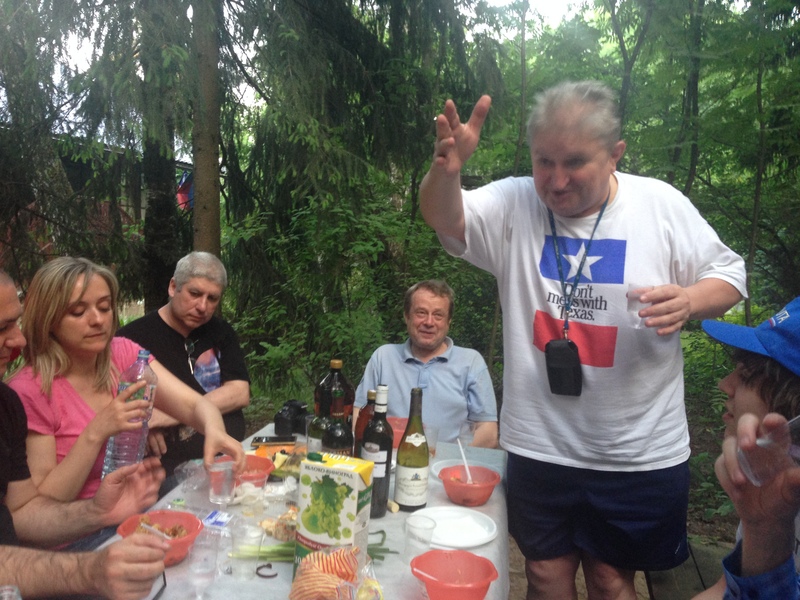 The day then found a wonderful end with an invitation from Anton Syromyatnikov, son of the designer of the Apollo-Soyuz docking adaptor Vladimir Syromyatnikov to a little Plov BBQ at his Datcha in a small hidden part of the city where lots of space engineers and cosmonauts live. We even had the chance to meet and greet some of them. The only airline to go directly besides the Roscosmos charter is an airline called Tulpar Air (I let you do the google research 🙂 ). Well, long story short, we lifted of with a slight and anticipated delay towards our next stop on a plane I dubbed #SpaceTupolev, where only later we learned it was THE plane that already had a nickname – Lucky Tupolev. 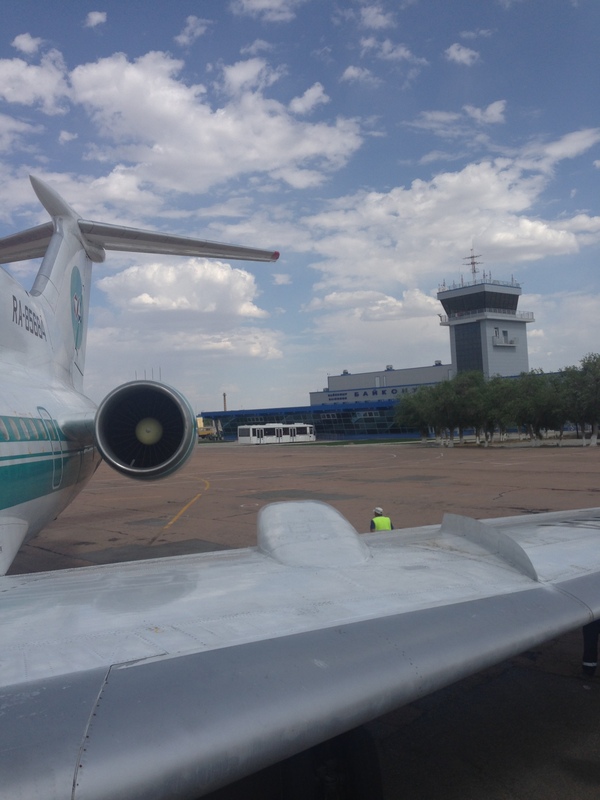 After getting over the anxiety of flying a plane probably older than I am and doubtful last revisions, I had the smoothest picter perfect touchdown of all my traveller life at Kraini Airport, just outside of the city of Baikonur. Immigration was a breeze and we were en route to our hotel in the city center. 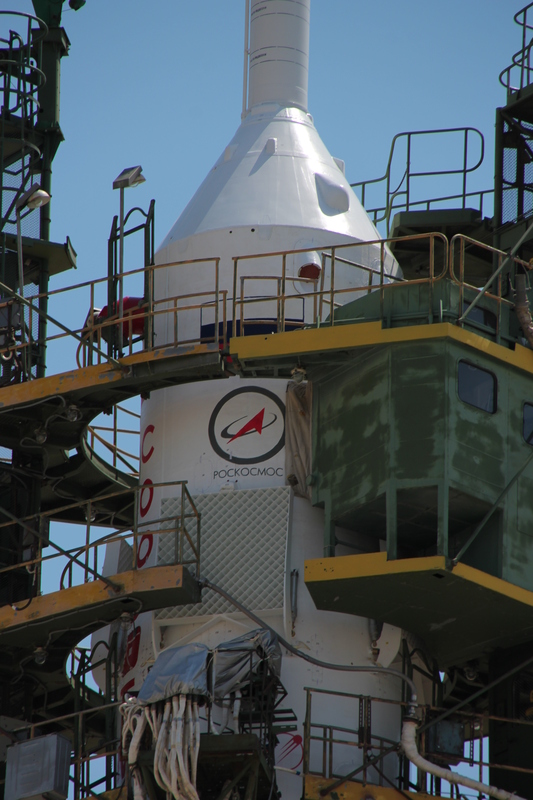 Baikonur is like a time capsule from the Soviet Era. Lots of statues from the master minds of early rocket science. But the most remarkable monument other than the signature fishermen monument where the Cosmonauts reguarly take a picture (we’ll come to it towards the end of the trip) is the full size Soyuz rocket in the extension of Baikonurs Arbat Street. But I am going too fast. 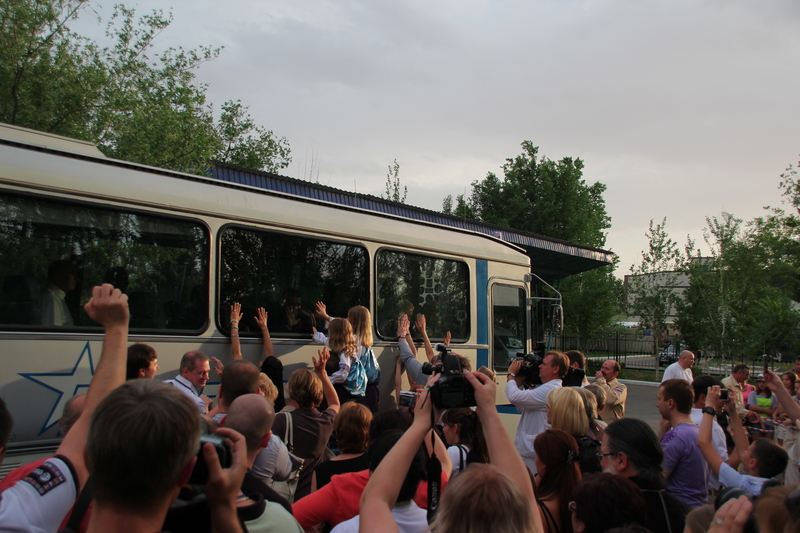 The moment when we closed in, to the pad, you could hear the clicking of camera shutters all over the bus and excited chatter from our group where for most of us a long standing dream was about to come true. 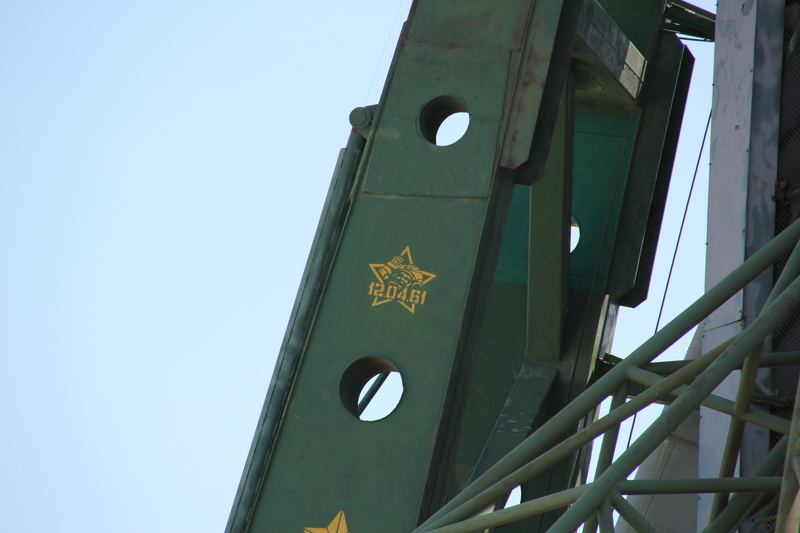 Having seen the Soyuz monument the other day I was still stunned, that the rocket looked small and almost too delicate to bear the violent acceleration forces. Maybe it was because the only “other rocket” I had seen in real life besides the Shuttle stack and far away Atlas’s and Delta’s was an Arian 5 in the Le Bourget museum in Paris. And the Ariane truly is a massive rocket. 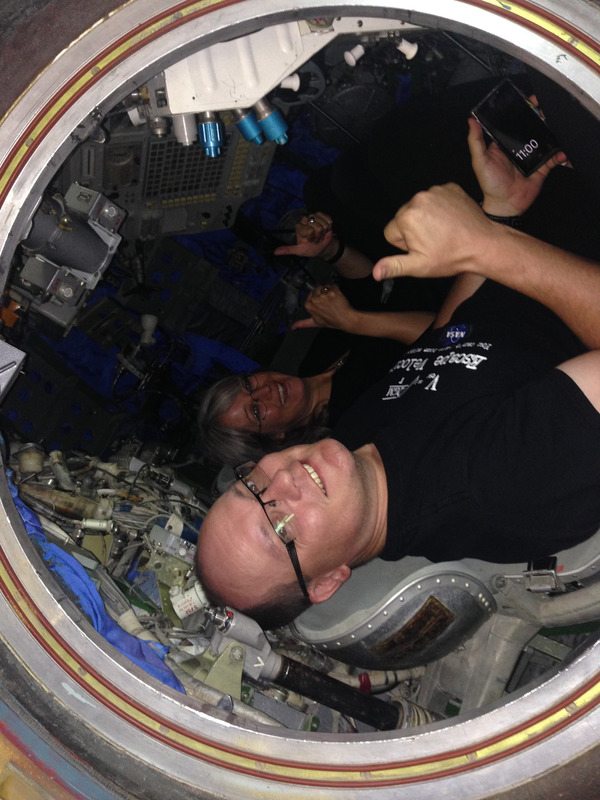 So, here we stood, barely 10 meters away from the vehicle that will bring the next crew to the International Space Station in a little over a day. Only after the visit it appeared to me that the fuel wagons in front of us were there for a reason. They were pumping Kerosine into the rocket. 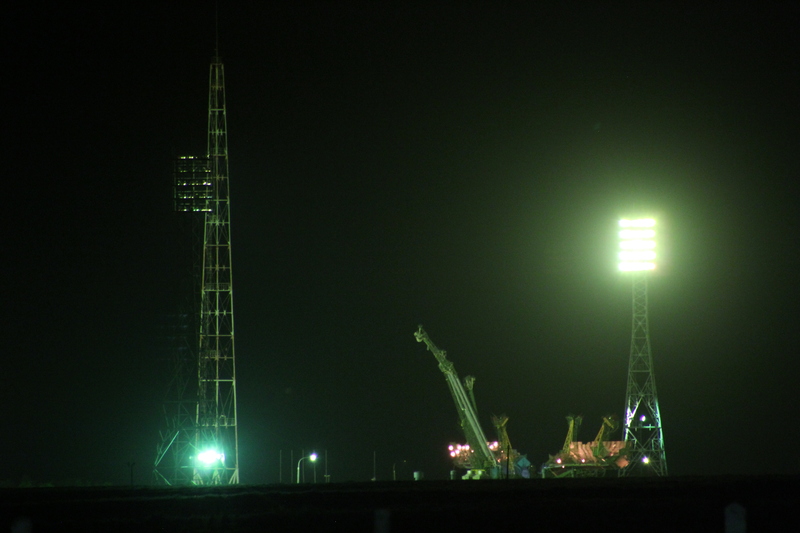 The launchpad by the way is the very same where Yuri Gagarin launched on his historic first ever human spaceflight! 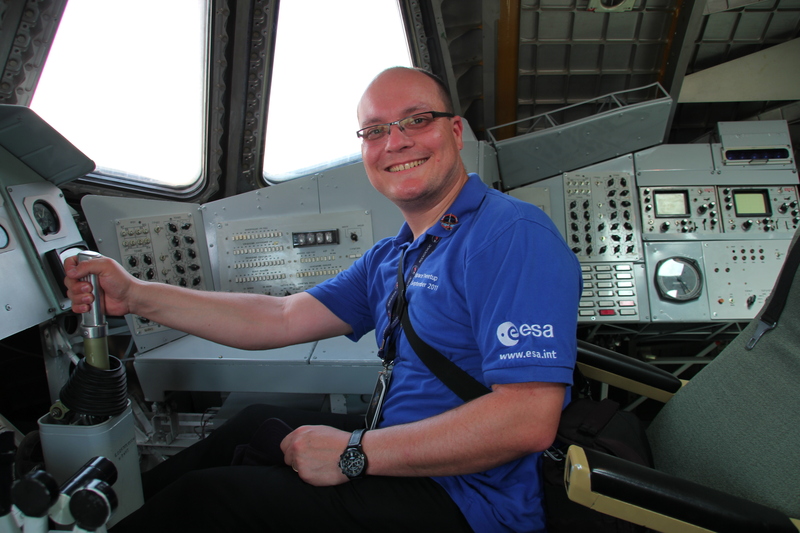 Waaaay too early we had to leave the wonderful spacecraft, but on our way back to Baikonur and to our next waypoint – the press conference – we had a quick stop at the Energiya museum to sit in the pilot seat of the Soviet Space Shuttle, the Buran! The press conference was heavily guarded and all of us had to go through bag searches and wait at a checkpoint with a machine gun armed guard. Finally we were allowed inside the quarantined hotel into the room I’ve seen countless times on TV, where in a short moment the Astronauts and Cosmonauts would appear behind glass. The interest in the mission was huge and so the little room filled quickly with everyone trying to get a good spot for taking pictures. You wouldn’t believe how relaxed they looked. I would have expected to see them more nervous. I mean they were supposed to be strapped on a big explosive stick in little more then 24 hours! 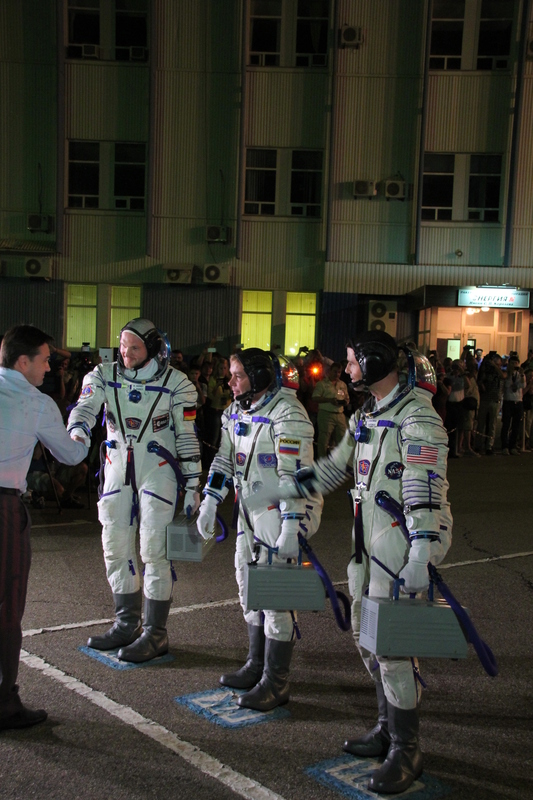 But no, the first thing Alexander Gerst did when they arrived, was taking a panorama and post it to social media (I assume). I caught him in the act 🙂 Maxim on the other hand, did his crew selfies and all of them waved at us once they recognized the crazy bunch. It was a moment to remember for sure, but it shouldn’t be the last of the wow-moments we had during this trip. 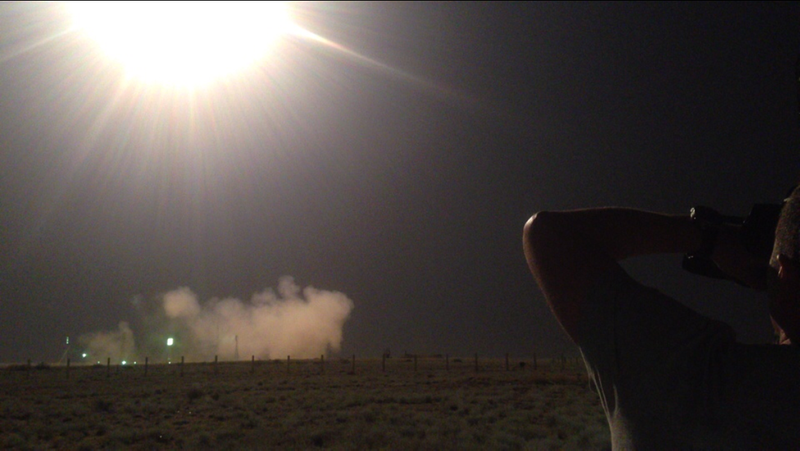 And then, finally it was here: LAUNCHDAY! 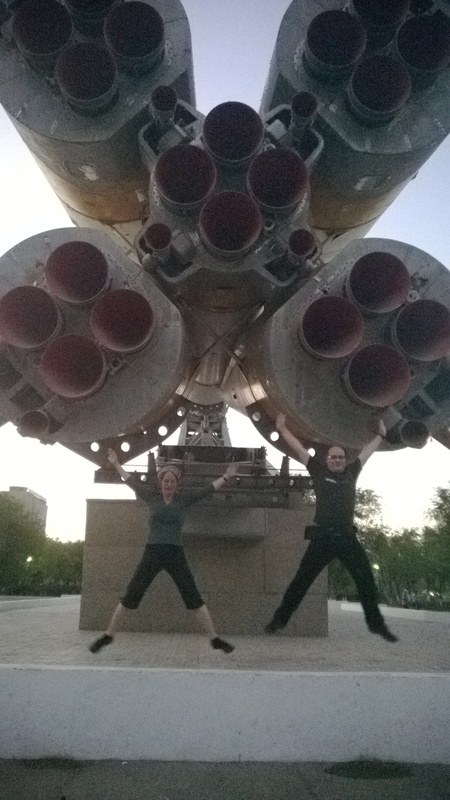 We had some time to kill and went for a walk in Baikonur city to see the variety of monuments and do some souvenir shopping at the market. 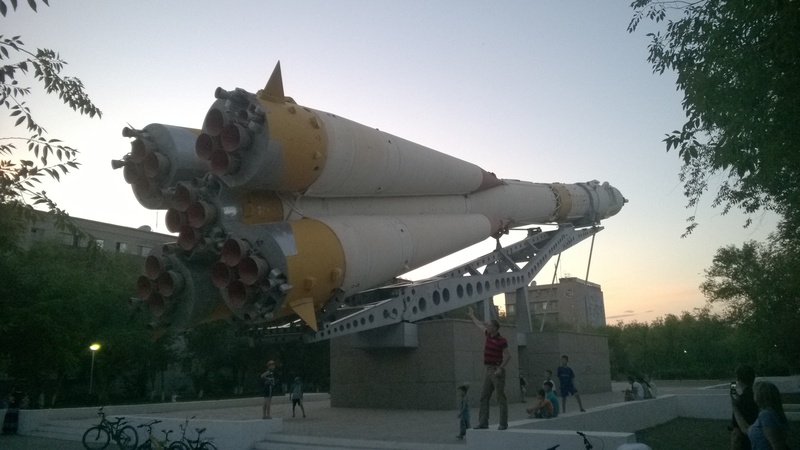 I really don’t know how to describe Baikonur, except for that timecapsule part which seems to be evident everywhere you go. Other than that, it seems to be deserted at times with wide parks beautifully built, but unmaintained for years (or so it seemed). 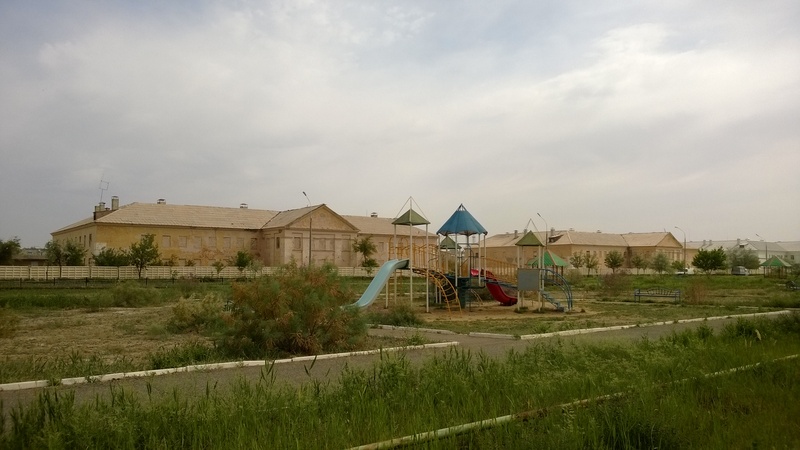 But Baikonur is a Space city foremost and this becomes evident when checking out the museums and tiny places one can visit. 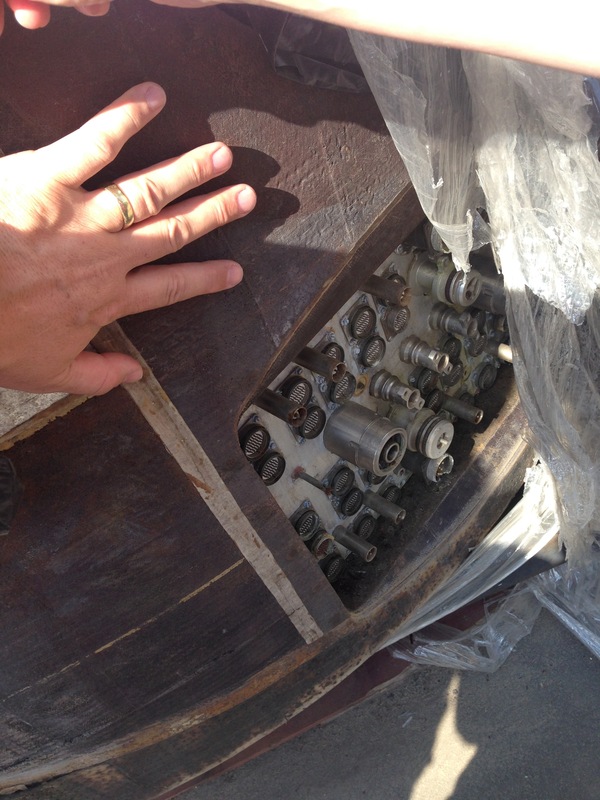 Lots of actual hardware to look at and to immerse oneself into the history of early spaceflight. For the actual walk-out, I was standing right behind the family and the friends of the astronauts and while they were blocking my view, it was special to see and share the emotions. Especially when Reid said goodbye to his daughters through the bus window. I can only imagine how hard it must be to be away from your kids for 6 month. We should see the cosmonauts one final time this night and this time I made sure I was in the right spot. 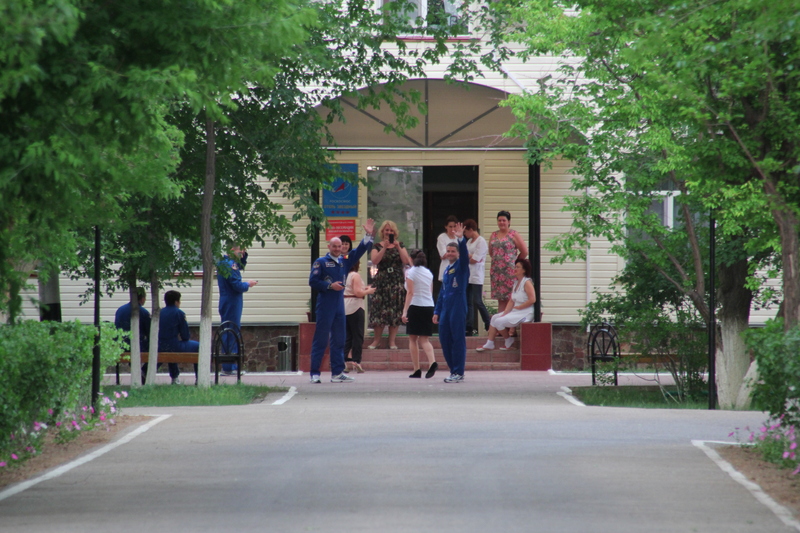 Russian Spaceflight is filled with traditions and one of those is the suited walk down to members of the state commission in front of what is the VAB of Russia, the Vertical integration building or just Building 254. A surreal moment that this is the last time we or the families will see them other than from video screens. We packed our stuff and went back to the bus to go to the grand finale. The three hour wait at the stands went by like a wink of an eye. 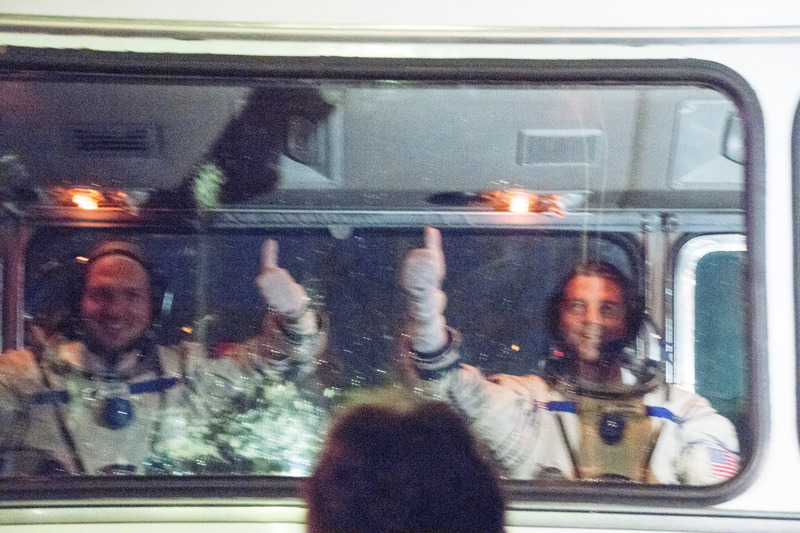 Part of it probably because the backup crew joint us for a moment and we all received a welcoming hug from Samantha Cristoforetti, which soon was to be prime crew herself! My cameras were set to auto and I was enjoying the view. Because this moments are to be treasured with your own eyes, not through the flicker of lcd displays. Hyped beyond belief, we followed another tradition and drank a wee dram of vodka to toast the successful launch. Tired and excited the trip back to the city was a mix of emotional chatter and silence of mindful-reflection. 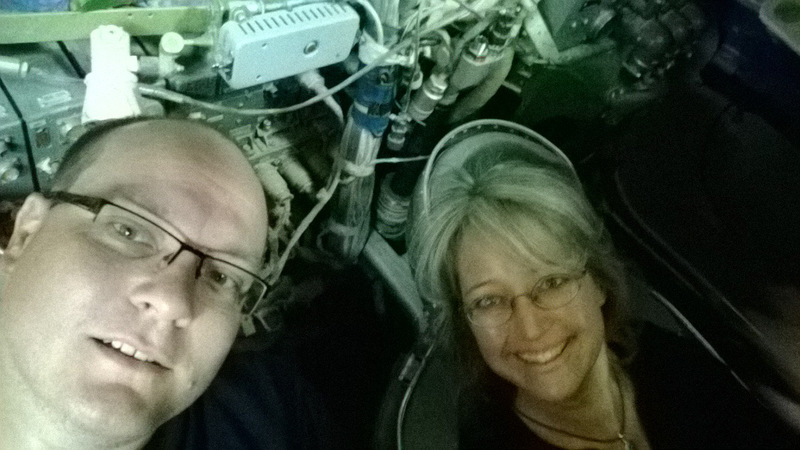 After a very short night (which some of the group skipped completely), docking of the Soyuz was our next waypoint. 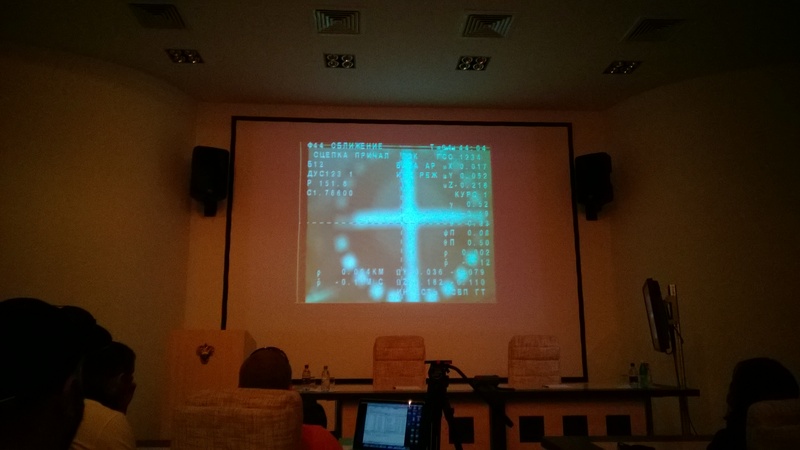 Roscosmos brought us to a small press room and beamed the video to the back of the wall. 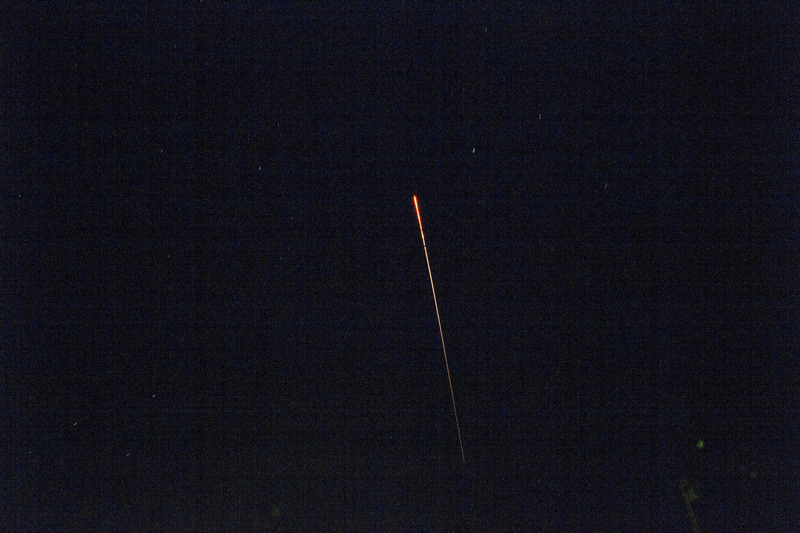 Another of those “unbelievable” moments when we realized it was the very same Spacecraft docking to the International Space Station just 6 hours after we saw them blast off from a site only kilometers away from where we are watching the docking. 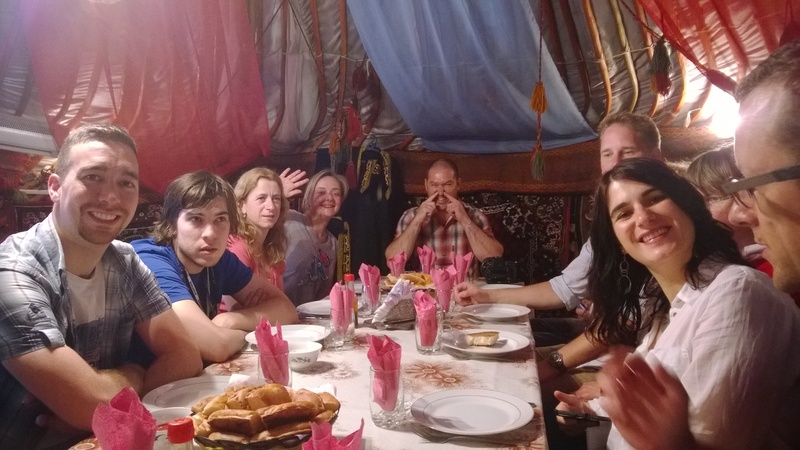 In the evening we had a big party for Expedition 40 and #AlexTweetup, Kazakh style. …well, there was one final highlight, before we returned to Moscow with our delayed Lucky Tupolev (funny thing, we knew a day in advance that we would take off 3 hours later). I like this picture to the right very much, as it shows how much we were allowed to play with the stuff in the school and also got to try only the newest hardware one can find. 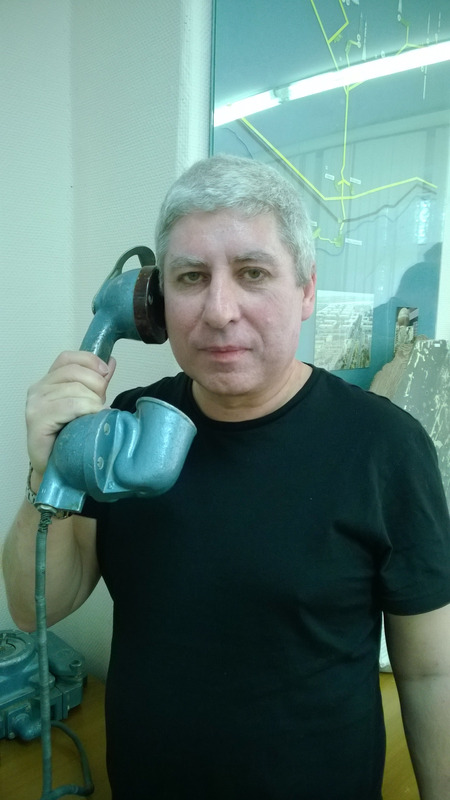 This phone will outlast humanity for centuries. Apple, Samsung, anyone? 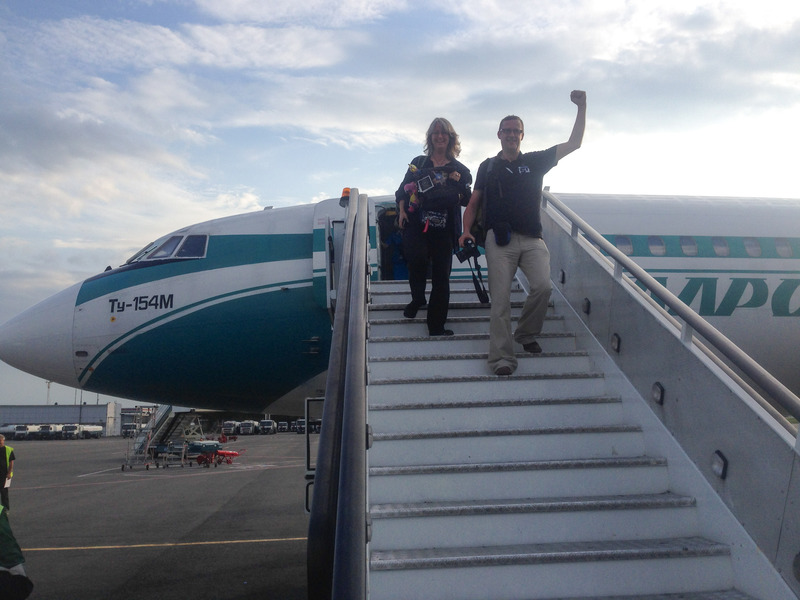 Lucky Tupolev has arrived in Domodedovo Airport in Moscow and this truely completes our trip to Baikonur and to the epic adventure seeing a liftoff of a Soyuz rocket that is! 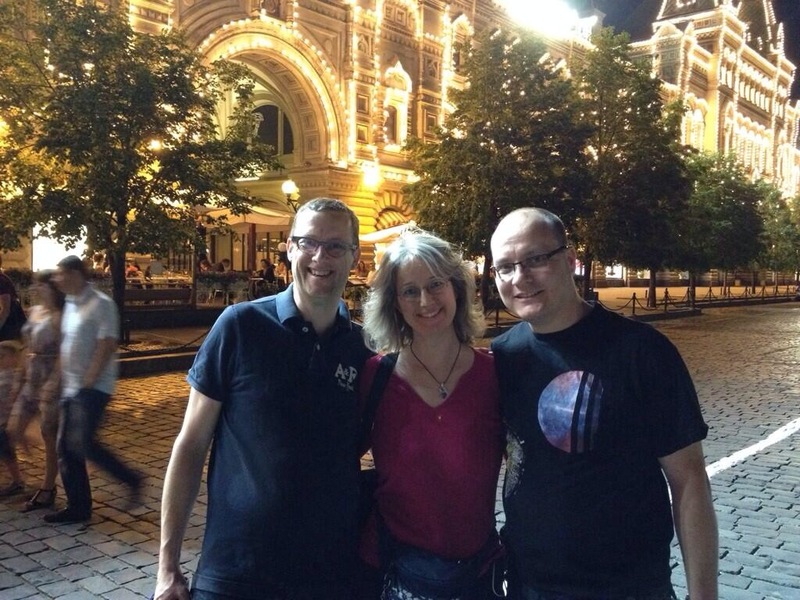 We spend another night in Moscow and wandered the Red Square at night. It is a beautiful city full of life around the clock. 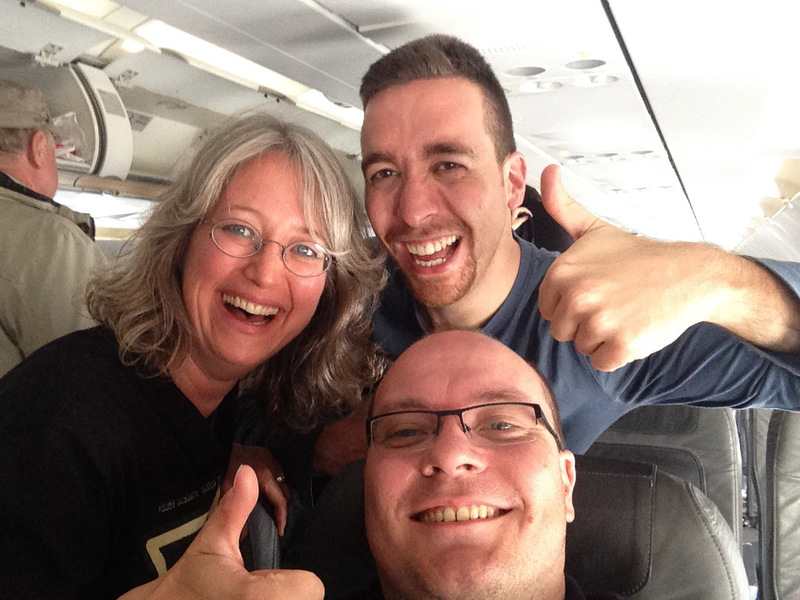 We had great surprise when boarding the flight back to Frankfurt, when our friend Goktug was with us and even had a seat in the row behind us. 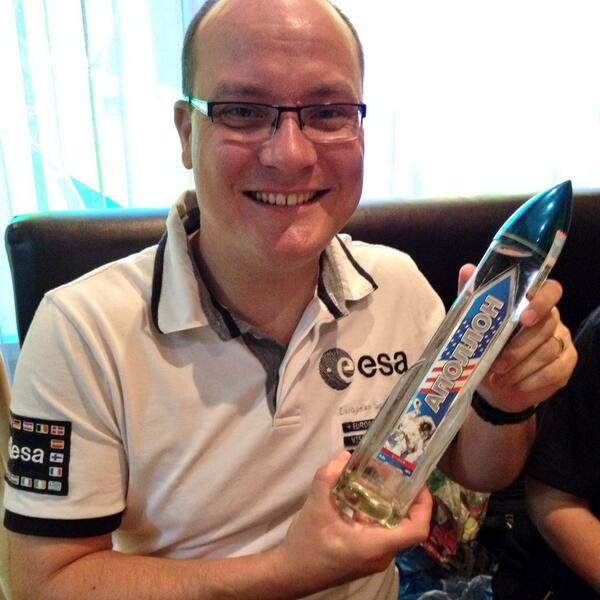 By the way, did I mention that the launch coincided with my birthday? What a candle! And thanks to all for the well wishes, the posts and the more than nice gifts! If you want to see the pictures of this blog full size and many more of the trip, head over to my flickr and also see the flickr group with the pictures of my fellow AlexTweetup travellers.